Last year I attended the wedding of one of my dearest friends. She’s one of the first friends I made when I moved to California, and 23 years later, even though I don’t see her as often as I’d like, she remains an important person in my life. After the ceremony, I chatted with a group of guests, sharing stories about the bride and groom. 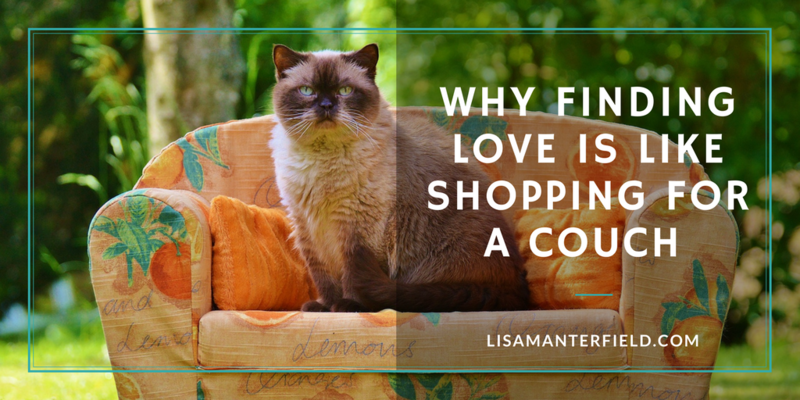 One guest recalled how my friend had once gone through a series of couches, ordering first one couch and trying it out in her home, only to send it back and order another. She did this until she finally found the perfect couch. A guest of the groom, who was only just getting to know my friend, was shocked that she would be so particular. But to me, it made perfect sense. My friend isn’t a difficult person, but as an artist and architect, she has an inner sense for when something belongs. Her apartments have always been sparsely furnished, but they were places I always felt at home. “But once she found the perfect couch,” I told the guests, picturing my friend sizing up the last couch and knowing this was the one. “She would have kept it forever.” The first guest nodded in agreement. I met my friend’s new husband for the first time at the wedding, and I knew right away that he was the perfect couch. My friend has tried out other “couches” over the years—the cerebral couch, the fun couch, the handsome, the creative, and the successful. Each was a perfectly good couch that fit her in some way, but I always had the sense they were “not quite right”. They matched, but they didn’t belong. “You know how you just know?” she had told me, when she announced she was getting married. I do know, and when I saw my friend walk down the aisle (at least what I could see of her through my tears) and take the hands of her beaming husband-to-be, I knew without a doubt that she and this kind, funny, handsome man belonged together. After years of shopping and returning, she had found her perfect couch. If you’re a goal-oriented person, you know to “keep your eye on the prize”, “learn to say no to things that don’t serve your path”, and “don’t sweat the small stuff.” If you also happen to be someone who cares about others, you know this last one can be the most challenging, but most important to implement. There’s always someone who wants your time and a million little emergencies that can hijack the pursuit of your goals. 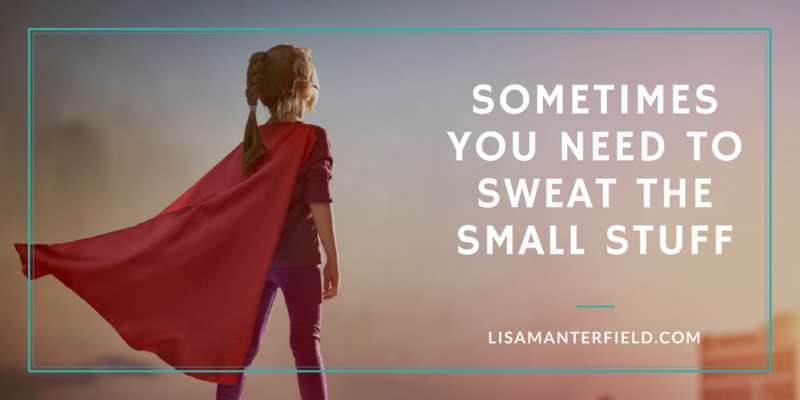 But sometimes, the small stuff needs to be sweated. Sometimes, someone else’s priorities can turn out to be the very best use of your time. I am visiting my mother in the U.K. this month. It’s a big chunk of time to be away from my desk, especially with a new book coming out in less than two months, and so I’ve planned several work days to make sure things keep ticking along in my absence. Today was one of those days. On my list for today was writing a blog post. I’ve had one I’ve been thinking about for a while, about tolerance, open-mindedness, and the importance of moving away from home to get a different perspective on the world. It’s a Very Important Blog Post and I needed to focus to make sure I said what I needed to say. All I needed was a couple of undisturbed hours. But in the middle of my writing, my mother realized she’d lost her emerald ring, the one given to her by my late stepfather. My mother is almost 85, and while she’s of extraordinarily sound mind, she worries about things to the point of obsession, and it was clear she was worried about the lost ring. I asked a few questions to prompt her to remember where she might have left it. 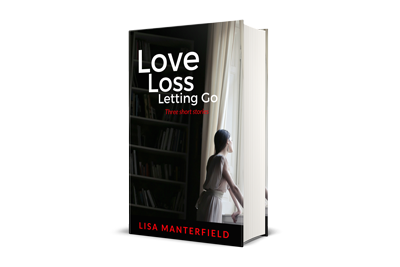 All she could recall was taking it off, perhaps to wash the dishes, and putting it down somewhere, reminding herself to get it later, but she couldn’t recall where. I knew I would have to stop what I was doing and help her look. But I couldn’t. Because, now she was afraid it had been knocked off into the trash can, even though that was virtually impossible. I couldn’t “go back to my work” and leave my mother to rummage through the trash and work herself into a frenzy. Begrudgingly, I pushed up from my laptop to mount a search. How Do You Define “Important” Anyway? 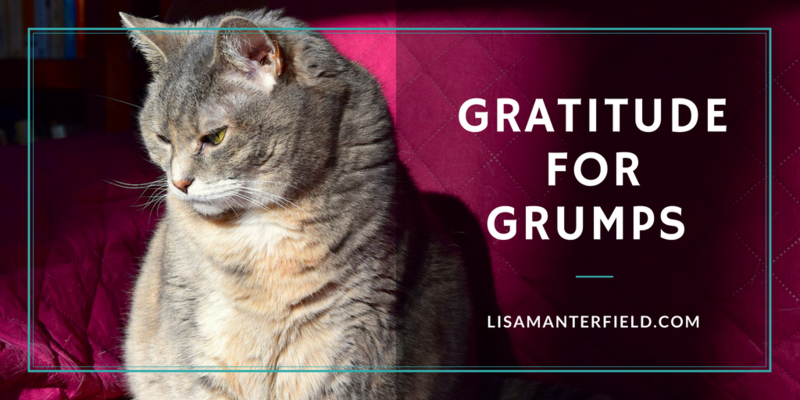 It was while I had my head stuck in the recycling bin, sifting through piles of catalogs and squeezing empty paper bags and envelopes, that I realized: My big important blog post wasn’t really that important in the grand scheme of things. Would my blog post change the world? Always possible, but highly unlikely. Would it affect even one person in a positive way? Perhaps. It’s what we writers always hope for. Would anyone’s life be turned upside down if my Very Important Blog Post didn’t go out this Monday? I knew the answer to all these questions was “no.” A year from now would this blog post that never happened really matter? But would my Mum’s life be upended if the trash was collected without her ring being found? Maybe. For several days, maybe weeks, she would be sad, angry with herself, wishing she’d tried harder to find the ring, perhaps wishing her daughter wasn’t such a self-important twit that she believed a blog post to be more important than helping her mother find something that was important to her. A year from now, would my mother’s missing ring matter? Perhaps it wouldn’t be the most important thing on her mind, but I think she would still have regrets that the ring had been lost. So, my Very Important Blog Post didn’t get written this week. But this post was written instead and I gained some perspective about what’s really important to me. A year from now, I believe my work will still be important to me and I intend to keep pursuing my goals. But when it comes to weighing one small work task against one small personal task, I’ll be applying the “year from now” analysis before I decide. And, in case you were wondering, Mum found her ring, but not in the trash can. She’d dropped it into an old jewelry box in the guest room for safekeeping and forgotten about it. It would have been the last place I’d looked. Last week, I got to write a really fun piece for my dear friend Teri Case and her “Dear Me” series. “Dear Me” is a letter of advice I would send to my younger self, so—of course—I took on the topic of love. 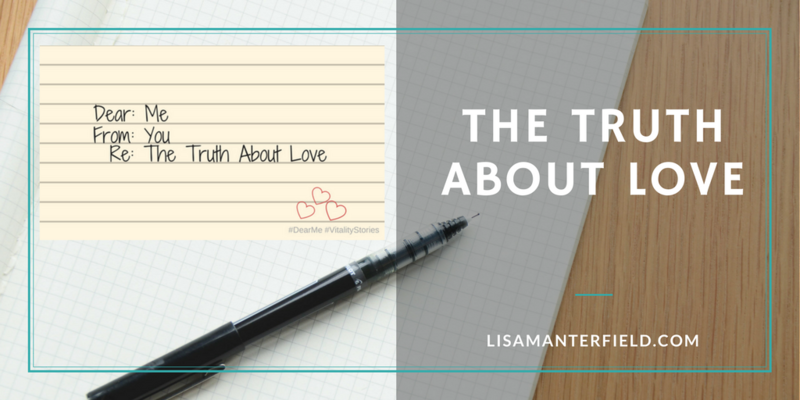 You can read “The Truth About Love” on Teri’s site. Teri kicked off her the series with her own important advice, “Dear Boobies”. Mary Jo Hazard talked about Being Perfect and Bobbi Mason wrote a powerful piece about Setting Healthy Boundaries. I hope you’ll give them a read. Feeling Helpless? Do Something Small. Does your world feel off-kilter at the moment? If so, you’re not alone. Whether you’re worried about the political situation, the climate, or changes in your neighborhood, health, or career prospects, there is a sense of unease in the air right now. And you’re not imagining it, either. A friend’s doctor reported seeing a sharp uptick in anxiety, depression, and stress-related symptoms in the past year. She prescribed a hiatus from news and social media, but while that might reduce news-driven anxiety, it can also make you feeling more disconnected and powerless. In his book, Tribe: On Homecoming and Belonging, Sebastian Junger cites a study conducted in Northern Ireland during the height of the conflict there. The study found that rates of depression and suicide dropped by 50 percent in Belfast around the time of the 1969 riots when the situation was at its worst. This is in line with other research showing improved mental health during wartime and other disasters when people pull together and help one another. However, in County Derry, an area outside the main Northern Ireland conflict zone, rates of depression increased. Researchers believe people in this region felt helpless because they couldn’t do anything to help those caught in the fighting. The solution to feeling helpless and anxious about things that feel out of our control seems to be to get involved. But not all of us are cut out to be activists and the “things you must do now” list can feel so overwhelming that it’s easier to shut down and hide. But, if you’re feeling like you can’t fix the world, I encourage you to do something. Humans are wired to help one another. In fact, selflessness is one of the things that distinguishes us from other primates. Doing something good for someone else, especially when it’s done with no expectation of anything in return, boosts our levels of serotonin, the chemical that makes us feel happy. A recent study, The Neurobiology of Giving Versus Receiving Support, noted a marked positive effect on areas of the brain related to stress. In other words, doing good makes us feel great. Get out there and do something small for someone. Smile at a stranger in the street, hold a door open for someone, give someone quarters for their meter, or buy a sandwich and a cup of coffee for a homeless person. If you want to up your game, offer to drive an elderly neighbor to a doctor appointment, walk a busy friend’s dog, or drop off some extra groceries or a meal for someone who’s been ill. It may not seem like much, but these small shifts could make a difference in someone’s day and dramatically improve yours. Try it, and let me know how it went.